Use the Columns subtab to display and edit all the column information for a table. With this subtab, you can add, drop, and alter columns. You can also use the Columns subtab to change column properties such as name, data type, and default value. The following figure shows an example of the Columns subtab. Move Up: Move the selected column up. Move Down: Move the selected column down. Copy: Copies the column for a model. Cut: Copies and then deletes the column for a model. Paste: Pastes the column. If a column with the same name already exists, then _copy1 is appended to the column name. Delete Selected Columns: Select multiple contiguous columns by right-clicking and pressing the Shift key. Use the Control key to select separated columns. Refresh: Update all information in the Columns subtab. Clear Default: Clear the assigned default value. Default NULL: Set the column default value to NULL. Default 0: Set the column default value to 0. Default CURRENT_TIMESTAMP: Available for TIMESTAMP data types. Default CURRENT_TIMESTAMP ON UPDATE CURRENT_TIMESTAMP: Available for TIMESTAMP data types. To add a column, click the Column Name field in an empty row and enter an appropriate value. Select a data type from the Datatype list. Select the column property check boxes as required according to the list of column properties that follow. For a description of each item, see CREATE TABLE. This option is available as of MySQL Server 5.7. To change the name, data type, default value, or comment of a column, double-click the value to edit it. You can also add column comments to the Column Comment field. It is also possible to set the column collation, using the list in the Column Details panel. To the left of the column name is an icon that indicates whether the column is a member of the primary key. If the icon is a small key, that column belongs to the primary key, otherwise the icon is a blue diamond or a white diamond. A blue diamond indicates the column has NN set. To add or remove a column from the primary key, double-click the icon. You can also add a primary key by checking the PRIMARY KEY check box in the Column Details section of the table editor. If you wish to create a composite primary key you can select multiple columns and check the PK check box. However, there is an additional step that is required, you must click the Indexes tab, then in the Index Columns panel you must set the desired order of the primary keys. 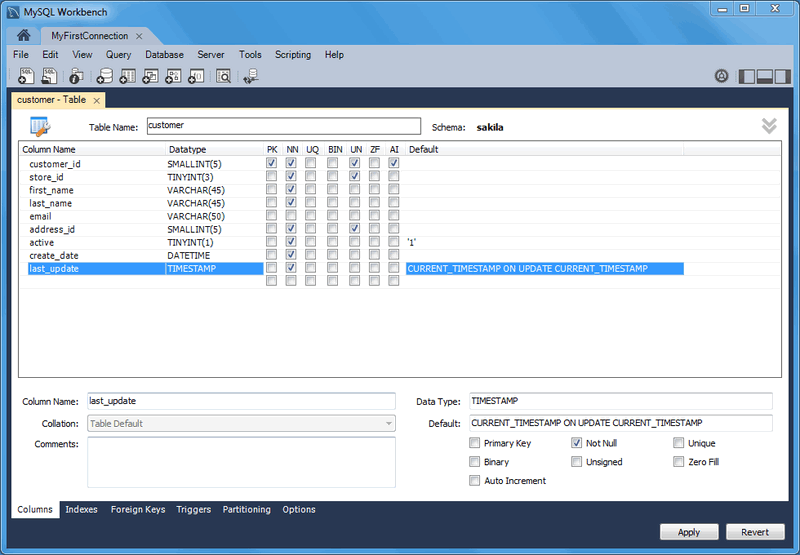 When entering default values, in the case of CHAR and VARCHAR data types MySQL Workbench will attempt to automatically add quotation marks, if the user does not start their entry with one. For other data types the user must manage quoting if required, as it will not be handled automatically by MySQL Workbench. Care must be taken when entering a default value for ENUM columns because a non-numeric default will not be automatically quoted. You must manually add single quote characters for the default value. Note that MySQL Workbench will not prevent you from entering the default value without the single quotation marks. If a non-numeric default value is entered without quotation marks, this will lead to errors. For example, if the model is reverse engineered, the script will contain unquoted default values for ENUM columns and will fail if an attempt is made to run the script on MySQL Server. ENUM, BIT, and SET must contain at least one value when entering these data types into MySQL Workbench.